Skin Picking Disorder, also known as dermatillomania, compulsive skin picking, habitual skin picking, and most recently excoriation disorder, is when someone picks or chews their skin frequently and is unable to stop the behavior on their own, causing visible damage to their body. It is so much more challenging than “just a habit.” I am deeply passionate about helping people who struggle with this problem and the many ways it factors into their life. 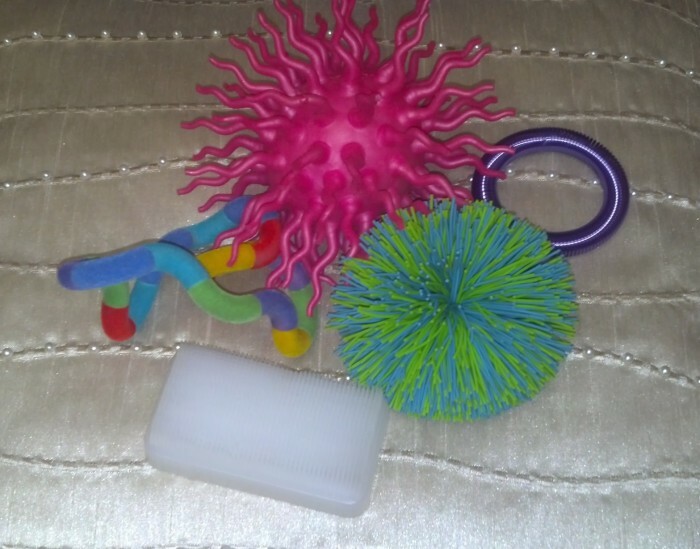 Fidgeting with interesting textures can keep hands busy to avoid skin picking, but fidgets are only a small part of effective treatment. Current research suggests that psychotherapy is the most effective Skin Picking Disorder treatment. I integrate approaches to best suite each client. For skin picking I use ComB (Comprehensive Behavior Therapy) which is basically an expanded form of cognitive behavior therapy (CBT) specifically designed for body focused repetitive behaviors. This lets me assess each person’s unique pattern of picking and then approach treatment in an informed manner instead of general interventions. Since each person is so much more than just that behavior, I turn to more general counseling techniques to support the whole person in growing towards wellness and resilience. If trauma is also a factor in the client’s life, I include Somatic Experiencing to resolve and heal the lingering effects of trauma. No! Skin Picking disorder is independent of Obsessive Compulsive Disorder (OCD) and requires specialized treatment that is different from OCD treatment. This disorder is in the same diagnostic chapter of OCD, but is a distinctly separate disorder. Very few therapists have specific and current training to treat skin picking disorder effectively, but I do. There is a lot of information out there that is out-dated or just wrong, which a non-specialized yet well meaning therapist inadvertently use. Previous counseling experiences can fall short of your goals for various reasons, including therapist fit, interventions used, and client readiness. I keep these in mind as we work together. We may spend quite a bit of time working on readiness, processing ambivalence about change, and getting the courage to try again. I help clients with skin picking almost every day and have helped many with their journey to recovery. That’s right, many success stories, even with client’s who have not had success in other treatments. I’m not saying it’s easy or fast, but it is very possible and so worth it! That’s OK! I am a qualified counselor with years of experience helping people with a wide range of mental health issues. Many who also have skin picking disorder (Excoriation), and many who don’t have any body focused repetitive behaviors. Anxiety, Depression, Grief, Trauma, Relationship Problems, Self Esteem, Shame, School/Work issues, Life Transitions, the list goes on. If you happen to struggle with something that I do not believe I can competently address, I will be honest with you and help you get the treatment that you need. I help each client as a whole person, you are so much more than your skin. But, I balance this with also helping you manage the skin picking if that is what you want. There are several things that set me apart from other therapists. I have extensive postgraduate education, clinical experience, and first hand experience specifically addressing how to treat skin picking disorder effectively. At least 80% of my practice is helping people with body focused repetitive behaviors such as skin picking. I help each client as a whole person, not just the skin picking. Every person with skin picking disorder has their own set of life experiences, family dynamics, strengths, and possible co-occurring disorders. I see and work with the big picture of your wellness. I provide a safe and accepting environment for discussing skin picking issues regardless of sexual, gender, cultural, or spiritual orientation. I offer a 30-minute consultation at no charge so you can see how you feel and whether you think we are a good match for one another. If you do not feel like we are a good fit for any reason, I will happily refer you to another therapist who might be a better match for you so you can get the help you are seeking. I invite you to contact me if you have any questions, concerns, or are ready to get started on your journey to recovery. Individual Counseling and/or Group Therapy options. 6 Pings/Trackbacks for "Skin Picking Disorder | Excoriation"
BFRB therapy groups are Accepting New Members. Scheduled on Wednesday focusing on recovering from Skin Picking (Excoriation) and Hair Pulling (Trichotillomania) as well as improving wellness and relationships in general. Please contact me to learn more at Priscilla@courage-counseling.com Interview Required Before Joining.